John Pilger’s compassionate direction and diligent investigations deserve enormous credit as his poignant and detailed documentary exposes the harrowing treatment of Australian’s black natives. 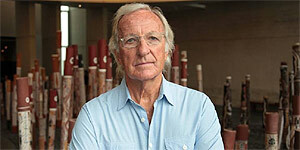 Written, directed and presented by renowned war correspondent and Emmy and Bafta-winning filmmaker, John Pilger, Utopia is a documentary film uncovering the disturbing truth about Australia’s racist attitude towards its black Aborigines. Beginning his journey in Sydney before moving on to Canberra and then an affluent suburb called Barton (recently named Australia’s most advantaged community), Pilger speaks to a wide range of both white and black natives in an attempt to investigate why the original Australians have been disgracefully reduced to sub-human status. Co-directed by Alan Lowery, the documentary exposes many little known facts about Australia’s persistent racism and the government’s reluctance to prioritise solving the extreme poverty amongst Aboriginals. Tackling a subject that is clearly under-discussed in today’s media, Utopia strongly succeeds at revealing an ugly side to Australia’s culture, exposing many incredibly disturbing facts about its continuing racism. Combining excellent black and white footage of former Aboriginal life with talking-head interviews as well as shots of people and places filmed by Pilger 28 years ago, perhaps Utopia’s most disturbing scenes come in the form of CCTV footage showing the police’s horrific treatment towards an unwell 27 year old black man, who eventually died after they ignored his cries for help. Shockingly, nobody was prosecuted and the fact that black Australians are imprisoned (for often, no apparent reason) at up to eight times the rate of blacks in apartheid South Africa chillingly proves that similar occurrences like this aren’t rare. Finally, the melancholic soundtrack, which peaks towards the final scenes, works wonderfully, perfectly suiting the film’s poignant tone. Deserving enormous praise for his conscientious investigations and evident concerns for the current treatment towards black Australian natives, Sydney-born John Pilger awards this engaging documentary with great substance. Never one to hold back during intense interviews, he impressively presses his subjects in an admirable bid to uncover answers about the appalling situation and his decision to visit Australia’s affluent white neighbourhoods (where properties rent for a staggering $40,000 a week) immediately before the poverty-stricken Utopia (where tiny kitchen-less huts are occupied by up to 20 people) really help to hammer the film’s central argument home. Incredibly researched and ever engaging, Utopia is an eye-opening and memorable documentary that’s definitely worth seeking out. Recommended.